It's no secret that I've been bitten by the parkrun bug - hard. I've done only four of them to date, but now I want the 50 parkruns t-shirt, the volunteers' swag, bag the points competition at my local parkrun, and experience as many parkruns as possible around the globe... And there aren't even any medals involved - who am I?! 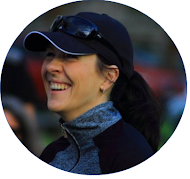 Blogging friend Old Runningfox recently sent me a funny parkrun video to watch, which made me think that there should be many, many more parkrun funnies out there. Here's what I found - hope you enjoy them too! Ow! Ow! 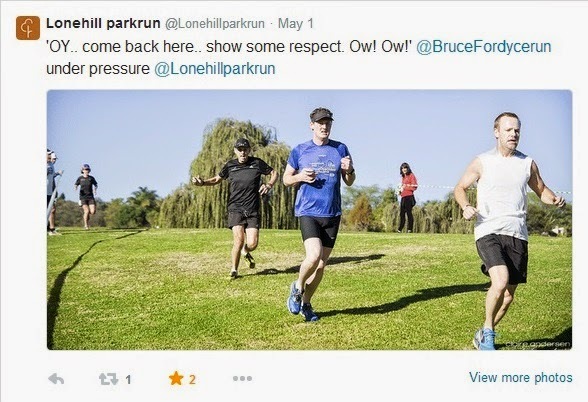 I found this gem on the Twitter feed of the Lonehill parkrun in Johannesburg, South Africa. It shows the King of Comrades, Bruce Fordyce (in black behind the guy in blue), chasing down two fellow parkrunners and contains the best photo caption I've seen in a long, long, time... Apologies, Bruce, but I just can't stop giggling! Welcome. Welcome. Then there's of course the not-so-welcome feathered Welcoming Committee that sometimes awaits runners at the Naval Hill parkrun in Bloemfontein... Watching runners sneak from their cars to the starting line is priceless - I'm actually contemplating sitting behind a bush and capturing it on film one of these days! Naval Hill parkrun's Welcoming Committee. The missing Lynx. Uhm, Caracal. A truckload full of PBs at a recent St Francis parkrun event caused volunteers to be just a tad suspicious. The explanation was revealed soon enough, though, when the Estate Manager came across this sight the following week, after route markers have been placed out: A cone-moving Caracal! Needless to say that, according to the parkrun SA newsletter, even more PBs were clocked after mentioning the presence of our feline friend during the race briefing... Only in Africa. 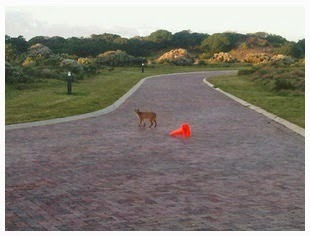 The case of the cone-moving Caracal (source). Do you have a funny parkrun moment/picture/video? Do you know about one? Please share in the comments! Just a warning: They're HIGHLY addictive, lol! I was never even interested in doing them, until I did the first one... The rest is, of course, history ;-) .